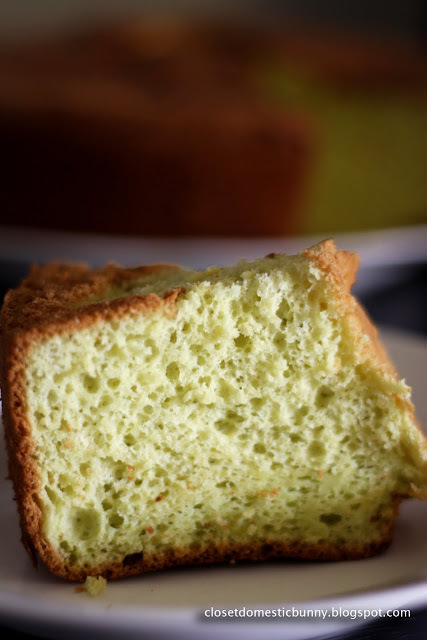 My older sister was inspired to bake a pandan chiffon cake by an episode of Masterchef Australia where a contestant, Jay Huxley, was eliminated because his rendition of Ms G's pandan chiffon cake was a flop. She remembered that she has a recipe for chiffon cake from her mother-in-law and told me that she was going to make one. I'm not one to pass up a chance to blog, so I said, "Count me in, count me in, count me in!" Plus, I still haven't figured out how to take great pictures while my hands are covered with food. Have to incessantly wipe my grubby paws before getting them on my camera. Not a problem when I'm not the one cooking. Start with making the pandan essence. You can use the bottled variety, which you can find from good asian stores. Bottled pandan essence will give you a brighter green cake, so it may be nicer presentation-wise. But this time we are making it from scratch, the traditional way. Start with cutting the pandan leaves into a manageable size to puree. Add 110mL of water, and blitz the essence out of it. It kind of looks like freshly mown grass. Moo? Here comes the messy part. 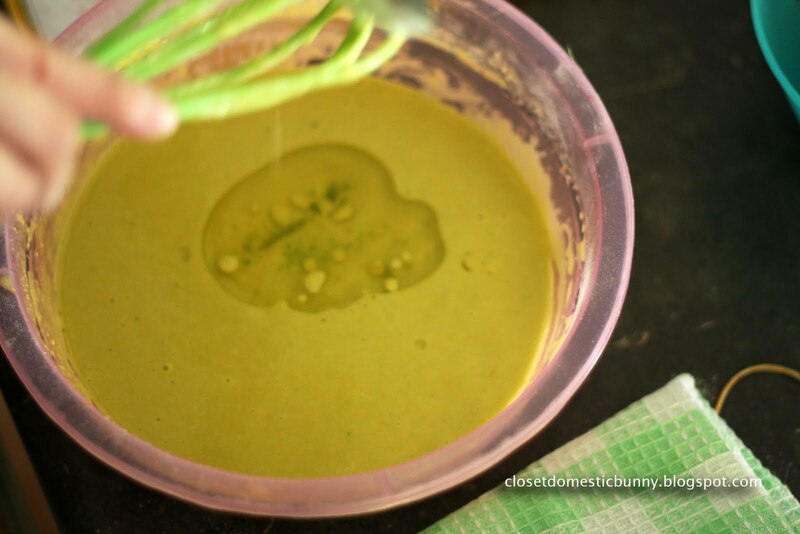 Scoop out the pureed pandan leaves into a muslin or cheesecloth. 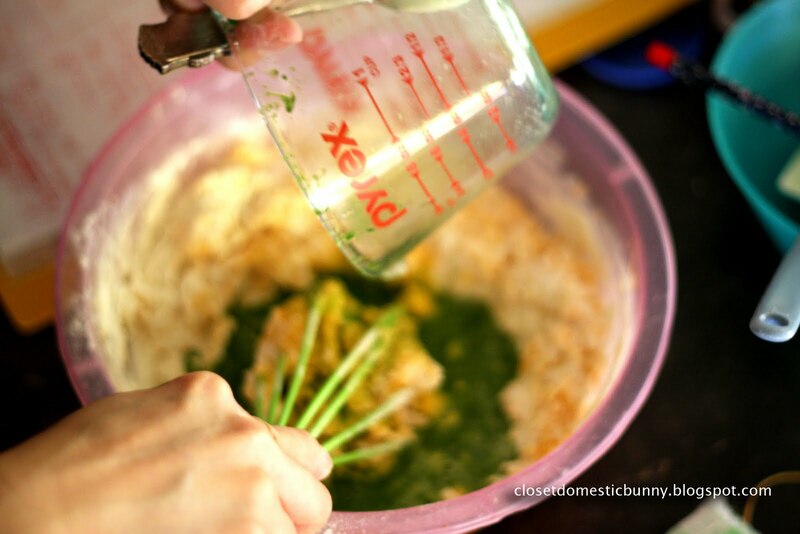 Squeeze out the glorious juice out of the pandan puree. Squeeze squeeze squeeze until your arms are sore. 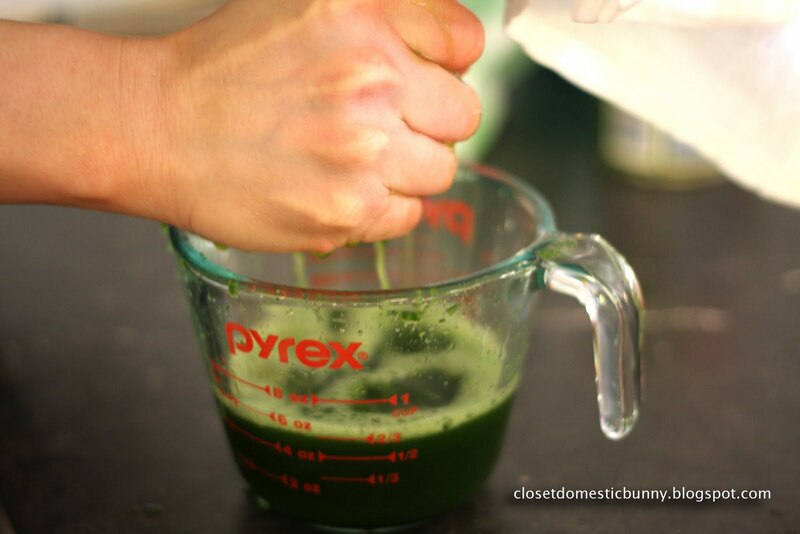 You should have about 110mL of juice, if not, add water to make up to 110mL. Then mix 1.5 teaspoon of baking powder into the juice. 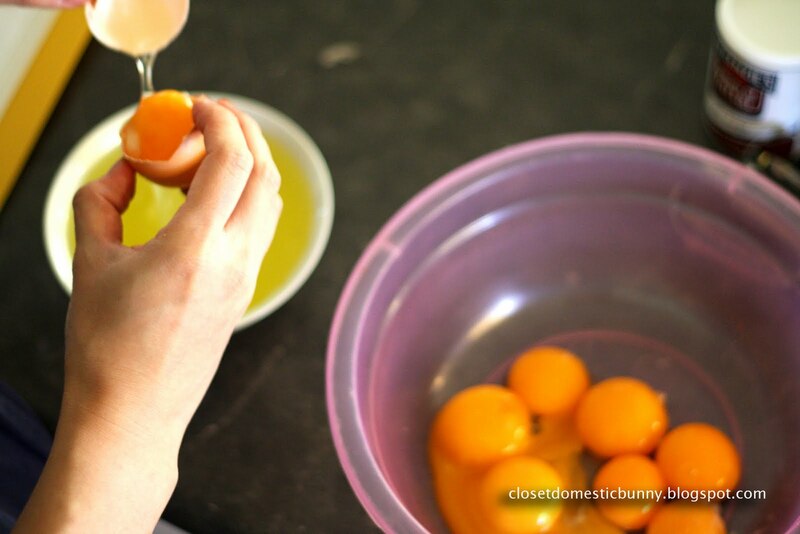 Now, on to the cake batter, start with separating the egg whites from the yolks. Add 5 sticks of cream tartar. You do this by scooping out the crystals from the container with either a toothpick or a chopstick. Don't ask me why, because I don't know why, this was just the way she was taught. Beat the egg whites to oblivion, by that I mean beat them with with your fists until they surrender, no, no, seriously just with a high speed hand mixer until stiff peaks are formed. Check it. 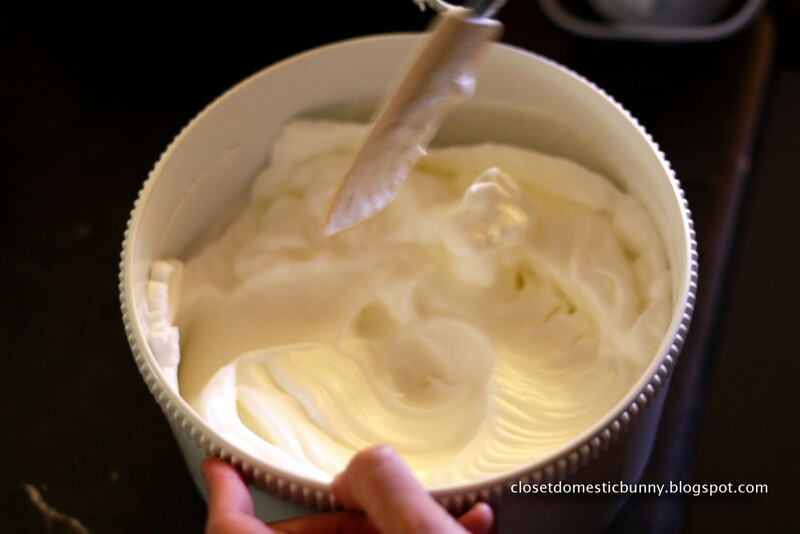 It's a satisfying feeling to run that spatula over the side of the bowl, to have the meringue lift cleanly off the side of the bowl. Bliss! It's now time to whisk the yellow eggy yolks using a hand whisk. Use that muscle of yours for 2 minutes straight. To the beaten yolks, add a mixture of sifted flour, sugar and salt. Mix, but don't worry about lumps at this point. 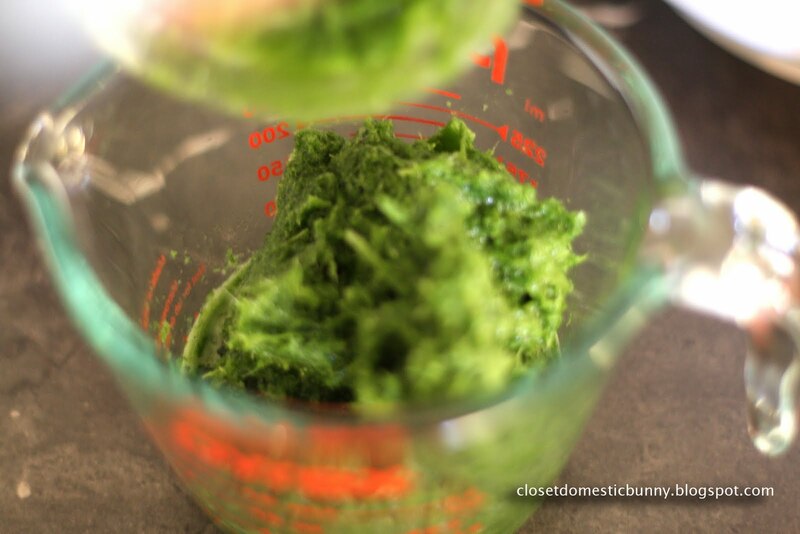 To the egg-flour mixture, add the green juice. Add 1 teaspoon of vanilla essence. Mix until all lumps are beaten out. 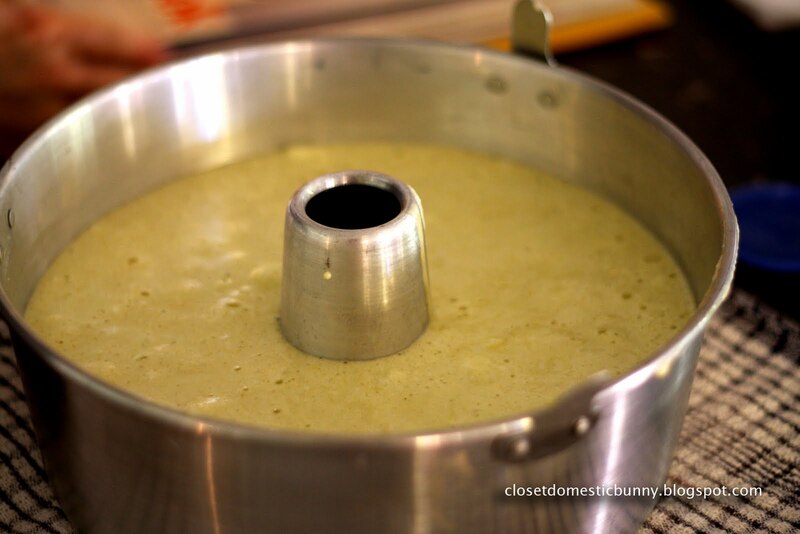 Mix in 100mL of canola oil into the pandan cake mixture. Add the meringue to the pandan cake mixture. Fold gently and evenly until mixture is combined. 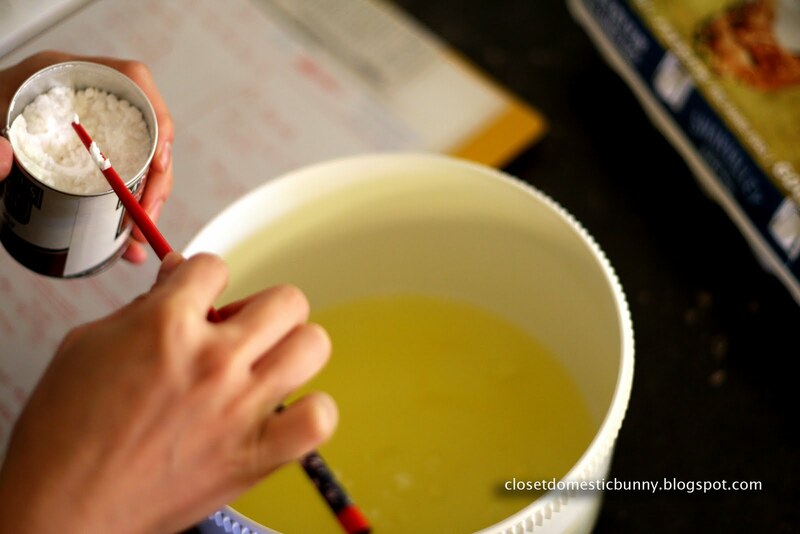 Pour the final cake mixture into a chiffon cake tin. And bake the cake at a 200°C preheated oven for about 40 minutes. When the surface of the cake is beautifully brown, you know you must've done something right in the world. But if it's not yet brown by 40 minutes, don't panic, it's probably because your oven is different to our oven, give it a bit more time, but keep your eye on it, it'd be a shame to burn all that hard work. You can check that your cake is done by sticking a skewer into the cake, if it comes out clean then your cake is baked through, if not, give it a bit more time in the oven. 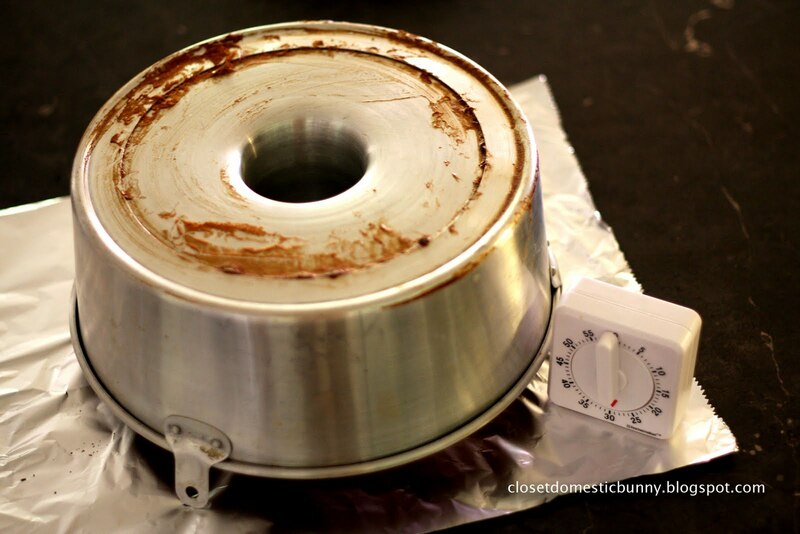 Take the cake out of the oven and invert the tin to cool the cake for 30 minutes. A chiffon cake tin has these spikes on its edge. When inverted, the tin is elevated, allowing the cake to cool, while stretching the cake downwards at the same time, making it a light, airy cake. The result? 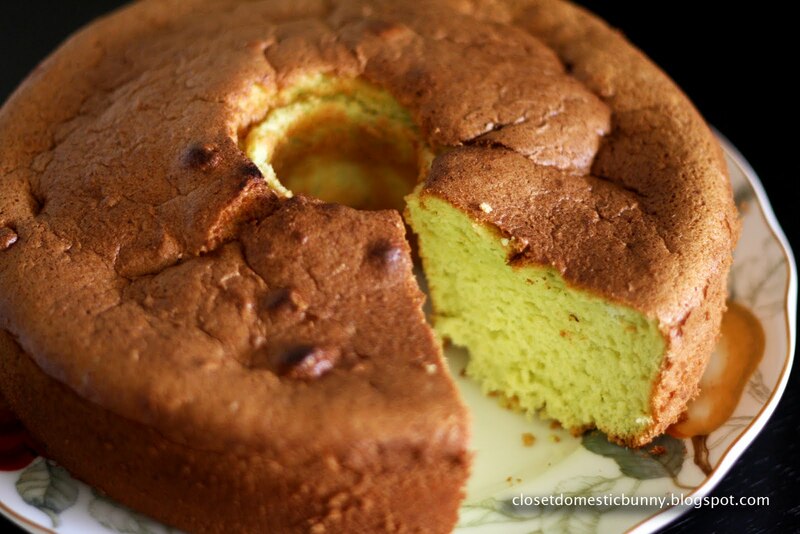 A light and moist cake with a fragrant pandan aroma. Nothing better to accompany your favourite cup of tea. 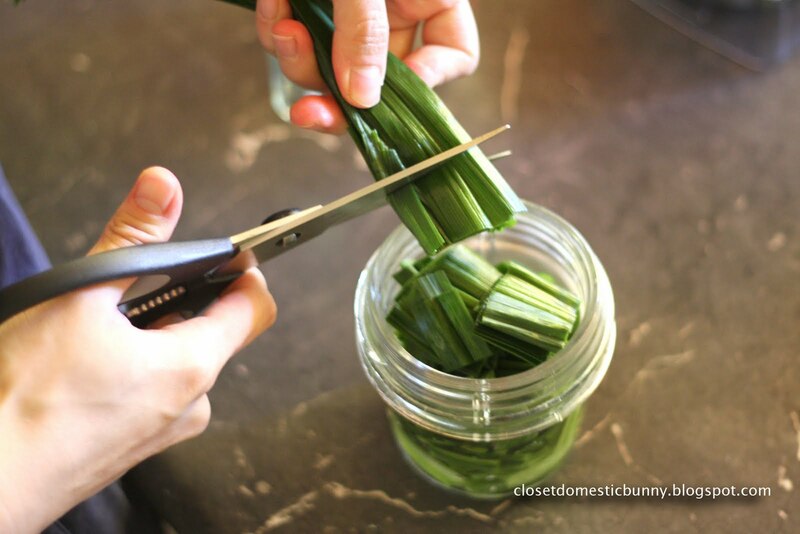 Cut the pandan leaves into the smallest size you can manage with a pair of scissors into a small blender. Add 110mL of water and puree the leaves. The puree doesn't need to be too smooth. 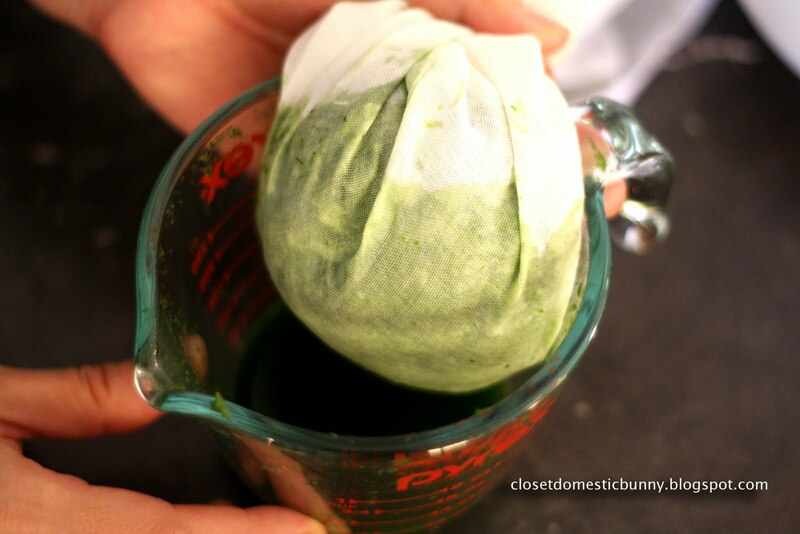 Extract the pandan juice by pouring the pandan puree into a muslin and squeeze the green juice out. Check the volume, if not 110mL, add water to make up the 110mL of liquid. 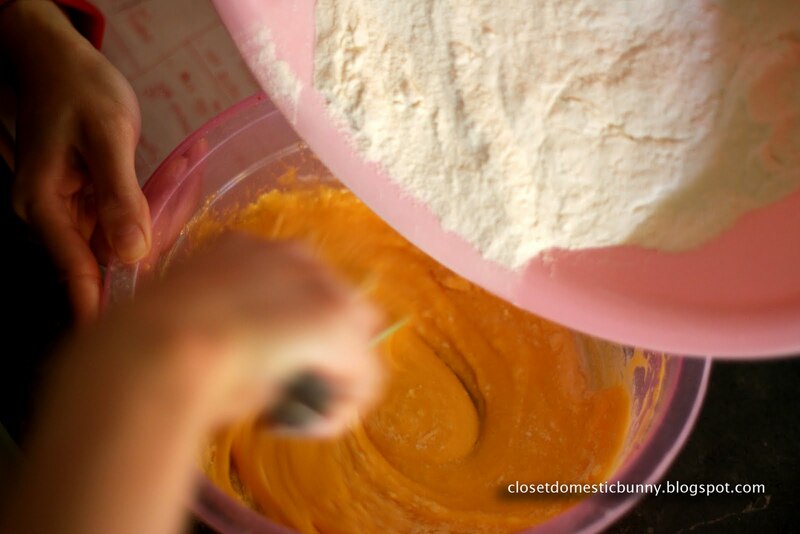 Mix into the juice 1.5 teaspoon of baking powder. 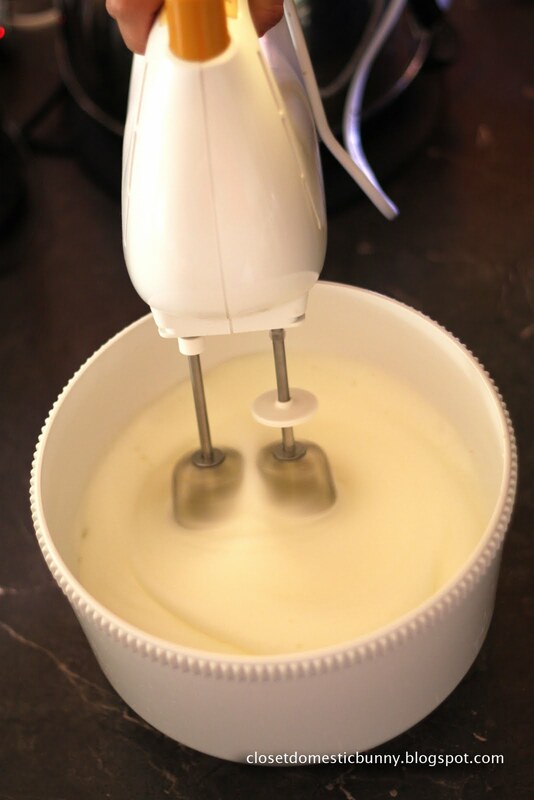 To make the cake batter, separate the egg whites from the yolk. 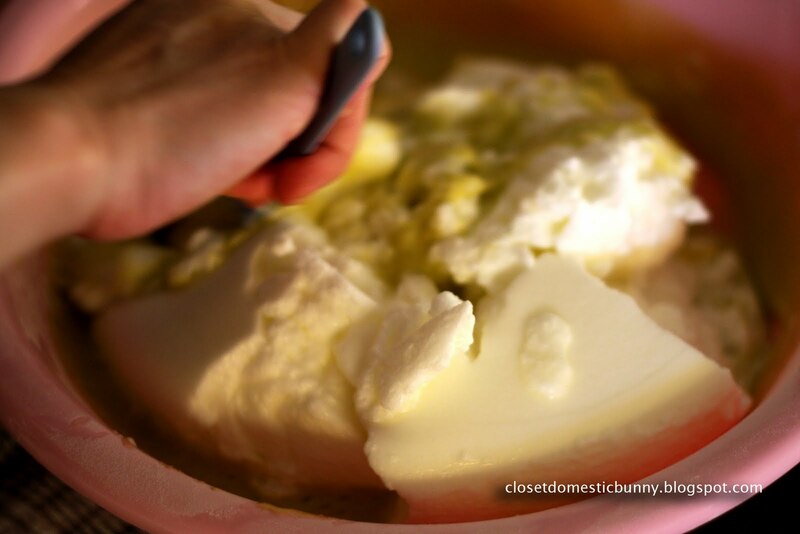 Add 5 sticks of cream of tartar into the egg whites, beat with a mixer until stiff peaks are formed. 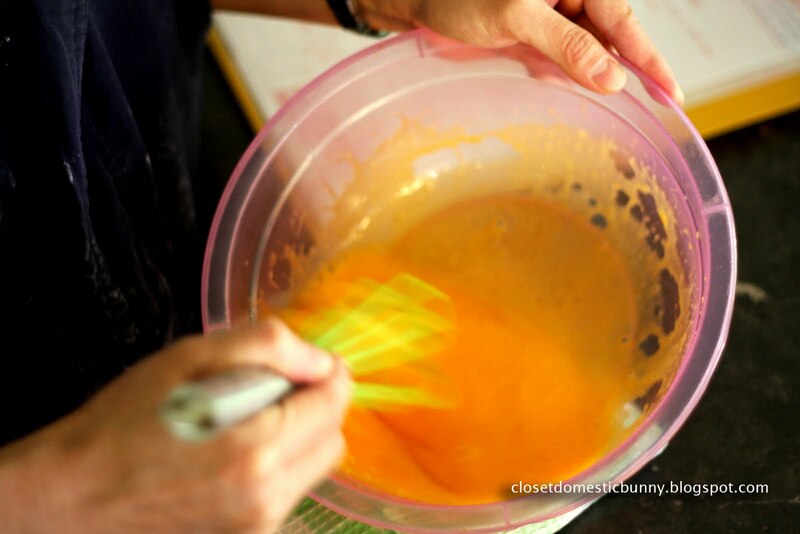 For the yellow egg yolks, beat using a hand whisk for 2 minutes. Then mix in the sifted flour, sugar and a pinch of salt. Mix in the pandan juice and vanilla essence. Add 100mL of vegetable oil. Mix until batter is smooth, lump-free. Add the egg whites meringue to the green egg yolk cake mixture. Fold gently, in as less motion as possible, until thoroughly combined. 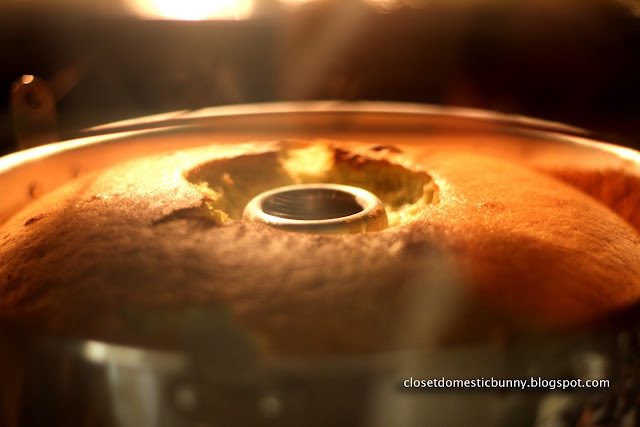 Pour cake mixture into chiffon cake tin, bake in the oven for about 40 minutes. Take cake out, invert the tin to cool and stretch the cake. Allow about 30 minutes. Serve a slice of the pandan chiffon with a cup of afternoon tea. Or even for a quick breakfast, the cake's only very very lightly sweetened. What a cake! Very interesting recipe! I will bookmark this for a future reference. Isn't it just? It's a really yummy cake, but we baked it without any decorations. Looking at your blog, I'm sure you can make it much prettier than we did.